I managed to see the ladies off to their various destinations before Stornoway Airport was closed. Ironically, my plane had been circling the airport for almost 45 minutes, unable to land due to the fog and had to return to Glasgow. The fog became very dense shortly after the ladies had left, but at least they managed to leave on time. The only one left at Stornoway, apart from myself was Mariah, whose flight to Glasgow for her connection to Heathrow was not until two days later. This was the first stage of her long journey back to Denver. Mariah had traveled the furthest and it was a pleasure to have had her her with us. Her quirky sense of humour and ready smile dovetailed perfectly with the rest of the group and I was sad to say goodbye to her after such a fun week. Following the cancellation of my flight, Loganair kindly put me up in a hotel in Stornoway in order to catch the ferry to Ullapool the following day. A bus would be waiting to take myself and the other fog-bound Loganair passengers from Ullapool to Glasgow for my return flight to East Midlands. I had a few days to myself on the Islands before the ladies arrived and I made full use of the time I had to finalise the tour itinerary. 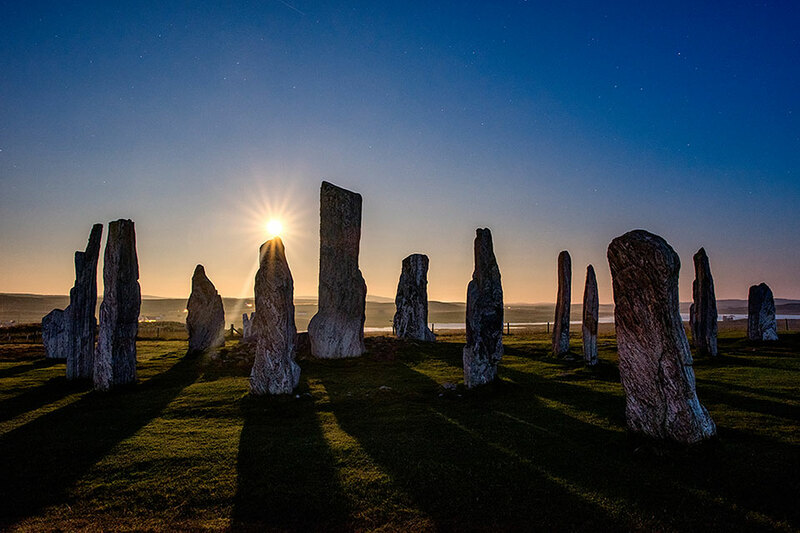 With high pressure and clear skies, I went to photograph sunset at Callanish Standing Stones on the evening before the guests' arrival. A supermoon was due and being there at that time was an event I did not want to miss. Midges were out in force before the sun disappeared but it was interesting to discover that as soon as the sun sank below the horizon, the midges disappeared! There was a period after 'the blue hour' when night descended and it became quite dark for a while. The darkness was shortlived, however, as the moon began to rise and the moonlight grew in intensity, the darkness began to turn to twilight very quickly. The light from the supermoon was astonishing, so bright that long shadows were cast by the stones. The moon began to resemble a small yellow sun! By 11pm, the moonlight seemed to be at it's most intense and I timed the exposure of the image below for when the rising moon coincided wit the top of the stone directly below it. Shortly afterwards it became impossible to work because of the vey heavy dew that was soaking my camera, lenses and filters. It was as if everything had been hosed with water! Although I had to pack my camera away, it was an amazing and rare thing to watch the supermoon at Callanish. One of those rare and unique events where everything comes together memorably. It was unforgettable! Supermoon at Callanish Standing Stones.